A funny thing happened in a bullock paddock in eastern Sydney 99 years ago last Friday. A plane took off – and they have been taking off from the same spot ever since, as years rolled by and the paddock developed into Sydney Airport. The 99th anniversary fell on Friday 9 November 2018. The countdown towards the big centennial year has now begun, with celebrations in the wind. In the meantime, the airport has launched a bushcare project to look after a special local wetland area of ecological significance. 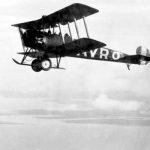 Piloted by Nigel Love, the first commercial flight from what is now Sydney Airport took place on 9 November 1919. In January 1920, this space was declared an aerodrome and has been operating ever since. It is now one of the longest continuously operating airports in the world. Today, Sydney Airport is Australia’s gateway airport, serving more than 43.3 million passengers a year and connecting Sydney to a network of over 100 international, domestic and regional destinations. 1920. 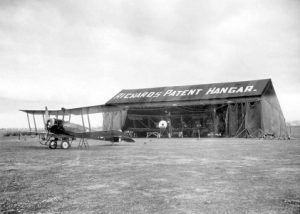 Richards Patent Hangar, capable of housing four aircraft, situated in the middle of Mascot aerodrome (now Syydney Airport), with two Avro 504k aircraft. There’s also a conservation side to the airport. In partnership with Conservation Volunteers Australia and Bayside Council, Sydney Airport has launched a three-year project to revive a critically important habitat and key community space. This partnership will involve engaging with the local community to drive environmental restoration activities throughout the Rockdale Wetlands Biodiversity Corridor. Bayside Mayor Bill Saravinovski says his council’s partnership with Conservation Volunteers Australia and Sydney Airport is helping improve the natural environment in Bayside. 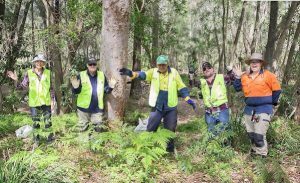 “This work complements the work of our Bushcare volunteers and supports our plan for the Hawthorne Street Natural Area and Scarborough Ponds,” Saravinovski said. The Rockdale Wetlands runs from the Cooks River to Sans Souci and has been identified as a critically important habitat for the protection of declining flora and fauna species in the local area. The parklands and riparian areas attract birdwatchers and nature study groups while also supporting a range of other recreational activities, including extensive cycling tracks, sporting fields, tennis courts and playgrounds used by the community. Sydney Airport chief executive Geoff Culbert said the airport was focused on supporting community and environmental assets in the Botany area. 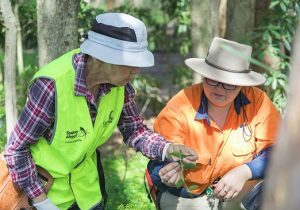 “Not only do the Rockdale Wetlands play an incredibly important role in supporting biodiversity in the area, but they also bring the community together,” he said. “We’re very pleased to partner with Conservation Volunteers Australia and Bayside Council to revive this critical habitat and nurture it for the benefit of the entire local community. Conservation Volunteers Australia chief executive Phil Harrison has welcomed the partnership. He pointed out that over the years this wetland area has been affected by serious environmental degradation through littering, green waste dumping “and of course, infestation from a host of different weeds”. “Despite this, it’s remained home to key fish as a breeding habitat, seven Endangered Ecological Communities and 28 fauna species listed as either threatened or migratory in the area. Volunteers can register to participate on the Reviving Rockdale Wetlands project by visiting www.conservationvolunteers.com.au or contacting Conservation Volunteers Sydney on 9331 1610. Located just eight kilometres from the city centre, Sydney Airport contributes AUD 38 billion in economic activity a year, equivalent to 6.8 per cent of the NSW economy. Sydney Airport is a major employer in NSW, generating more than 338,500 direct and indirect jobs, equivalent to 10.1% of NSW employment. 30,900 of these jobs are at the airport itself across 800 different businesses.